Oral cavity (mouth) : - The oral cavity includes the lips, the front two-thirds of the tongue, the gingiva (gums), the buccal mucosa (lining inside the cheeks and lips), the floor (bottom) of the mouth under the tongue, the hard palate (bony top of the mouth), and the small area behind the wisdom teeth. Nasopharynx : - The nasopharynx, the upper part of the pharynx, is behind the nose. 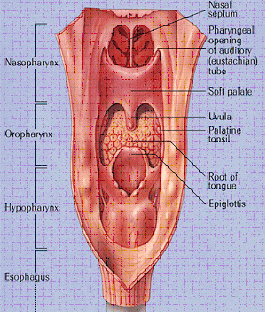 Oropharynx : - The oropharynx is the middle part of the pharynx. The oropharynx includes the soft palate (the back of the mouth), the base of the tongue, and the tonsils. Hypopharynx : - The hypopharynx is the lower part of the pharynx. larynx ("Adam's apple" or voice box) : - The larynx, also called the voicebox, is a short passageway formed by cartilage just below the pharynx in the neck. The larynx contains the vocal cords. It also has a small piece of tissue, called the epiglottis, which moves to cover the larynx to prevent food from entering the air passages. Salivary glands (parotid, submanidular, sublingual glands) : - The salivary glands produce saliva, the fluid that keeps mucosal surfaces in the mouth and throat moist. There are many salivary glands; the major ones are in the floor of the mouth, and near the jawbone. Tumors of the Nasal Cavity and Paranasal Sinuses. These are common symptoms of head and neck cancer in general. Sometimes the treatment of head and neck cancers will involve two or more treatments combined together. The surgeon may need to remove part of the mouth or throat lining and occasionally some facial skin. This can be replaced using a thick piece of skin taken from another part of the body - usually the forearm or chest. This is known as a skin flap. by implanting radioactive material into the tumour and leaving it there for a few days. This is known as internal radiotherapy, interstitial radiotherapy or brachytherapy. Read More. Chemotherapy is the use of anti-cancer (cytotoxic) drugs to destroy cancer cells. They work by disrupting the growth of cancer cells. As the drugs circulate in the bloodstream, they can reach the cancer cells all over the body. Chemotherapy may be used before or after surgery or radiotherapy to try to increase their effectiveness. Sometimes chemotherapy may be given at the same time as radiotherapy (a treatment known as chemo-radiotherapy), as they can be more effective if they are given together. Chemotherapy may also be given to people whose cancer has spread to other parts of the body or whose cancer has come back after radiotherapy. It is used in this situation to try to shrink and control the cancer and relieve symptoms, to try to prolong a good quality of life. Read More.